For consistency, should all paginators use the same code? Otherwise, we might get into the situation again that we have had until 15.04 where there were at least 3 different implementations. Site pages pagination seems to break when you select page 1 then 2 and then go back to page 1. 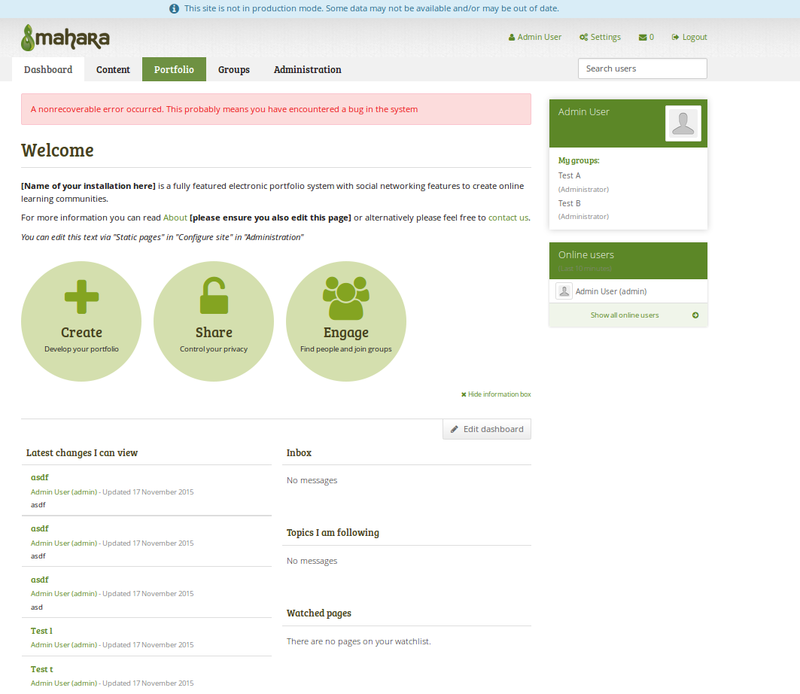 Dashboard template, Group homepage template, profile template and page template options are no longer displayed. When I tested portfolio page list pagination I produced a bug on the homepage. When I tested pagination for 'online users' I did not have the option to change results per page. When I tested pagination for portfolio/collections I did not have the option to change results per page. When I tested pagination for Content/journals I did not have the option to change results per page. When I tested pagination for Groups/My groups I did not have the option to change results per page. When I tested pagination for content/plans and content/plans/tasks I did not have the option to change results per page. 1. Content/journals: when you change the settings to allow multiple journals and then add more than 10 the pagination disappears when you select the number or arrows in the pagination. 3. htdocs/webservice/admin/webservicelogs.php : pagination and results drop-down displays, but when selecting 10 results per page from the drop-down it only displays 8 results of a total 18. Hi Robert I just created 22 pages to see how the pagination behaves on three pages. After creating them I proceeded to My Groups and selected "All my groups" from the filter. I selected "1" from the "Results per page" drop down and of course I was shown the first of my groups "Pagination Group". I then proceeded to click on the progress arrow which took me to the second page "Pagination Group1". However on the third click I was shown the 10th page which is very wrong because 2 comes after 1 and that's what I was expecting. Unless it's been coded like that to jump from 1 to 10 instead of 1 to 2. Anyway please see the attached. We sorted out Charlie's problem. There is no incorrect behavior in Mahara. Groups were listed in alphabetical order correctly.